Under the Waste Disposal Ordinance (Cap.354) - Waste Disposal Regulations, Hong Kong Environmental Protection Department has defined chemical waste as any substance or thing being scrap material, effluent, or an unwanted substance or by-product arising from the application of or in the course of any process or trade activity, and which is or contains any substance or chemical specified in the prescribed schedule if such substance or chemical occurs in such form (http://www.epd.gov.hk/epd/english/environmentinhk/waste/guide_ref/files/guide_e.pdf), quantity or concentration so as to cause pollution, constitute a danger to health or risk of pollution to the environment. Chemical waste should be properly and temporarily stored by the waste producer before the waste is transferred by the waste collector to a licensed treatment provider. 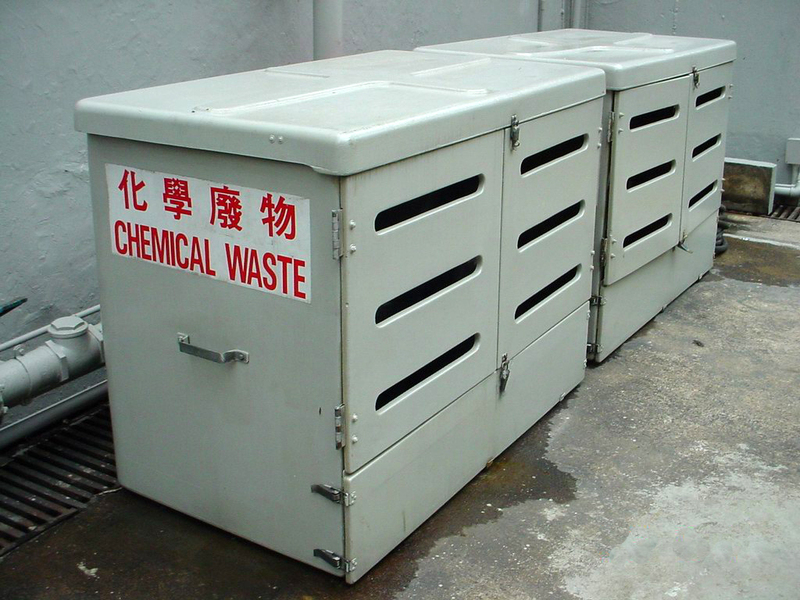 There are certain criteria should be applied to the containers for temporary chemical waste storage, including its material, condition, etc. Such containers should be placed in a suitable area located close to the waste generation source for temporary storage and the containers should be either drums or jerricans type. The size of the containers should be determined according to the quantity and frequency of chemical waste to be stored. Common types of materials to be used for the containers include plastics and steel. The storage area should be enclosed on at least three sides by partition, wall or fence with a height of not less than two metres or the total height of containers in stack, whichever is less. Such enclosures should be built with concrete, brick of steel with fixed erection to the areas. In addition, appropriate labeling should also be applied for accurate indication to ensure proper and safe handling, storage and transport of the waste. Business Coverage: Used oil and solvent re-refinery, manufacturing, trading and marketing of lubricants, environmental-related technologies, precision metal components, industrial equipment, lubricating oil analysis services, and specialty chemicals.